We have a lot of this plant. 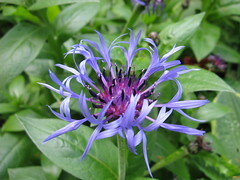 It appeared this spring, took a long time to flower, and then a while for us to figure out what on earth it was. (Centauria Montana. It spreads.) And then it all fell over, the flowers were fading, and I trimmed it back. And it’s starting again! 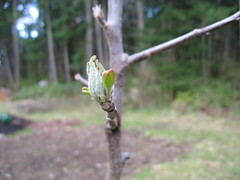 It’s sending up new shoots, just like it did back in, oh, April. 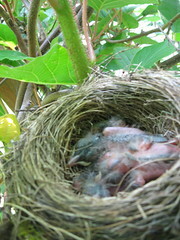 A little while ago, we noticed a bird’s nest perched on top of the fence in the depths of our kiwi vine. It was impossible to look into it, since it is just about head height, so I did what any sane, digital-camera-equipped, curious (okay, nosy) person would — I held my camera over it and took a picture. 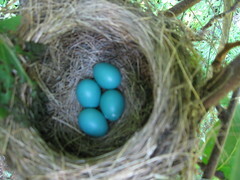 There were four perfect little blue robin’s eggs. We watched and tried to stay clear of it for a couple of weeks. Of course, I’m also trying to watch the kiwi vines for blossoms, so we can tell if we’ve got a mating pair and any hope of fruit or not, and quite a few times I scared the mama bird and she flapped off, squawking indignantly at me. I took a few more pictures here and there to see what had become of her eggs. They thought my camera was mama! Scared the life out of me! And apparently I don’t learn, because I did it again a few days later! They’re clearly getting a little bigger. I can’t tell how many there are, though. A few days ago we discovered another robin’s nest, hidden in the blackberries we were trying to hack back, because we accidentally knocked two fledglings out onto the ground. They were probably only a day or so from being able to really fly, and they hopped and fluttered around a few inches above the ground. The entire local community of adult robins perched themselves in the surrounding trees and started yelling at us. They were mad. And there were lots of them. 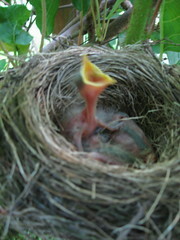 And they all cared about these little guys, it wasn’t just one mama. I had no idea they were so village-ish. Eric found one in the grass and managed to carry it back to the bushes where it was more camouflaged and hopefully safer. 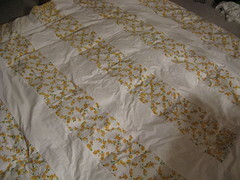 New duvet cover, made from three old sheets found at the thrift store. Vintage yellow roses feel so happy and summery. Even if they’re covering up a feather duvet, still in use most nights in July. 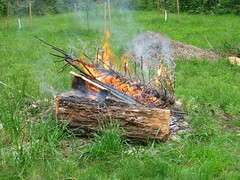 On the weekend of the solstice, we had our own sort of special celebration to mark the event. 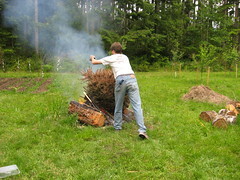 We burned the Christmas tree. 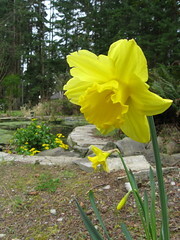 We’d been saving it in our little half-acre woods since taking it out of the house in January. 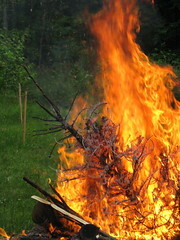 It was seriously dried up and caught fire quickly. This is just the top half, I wasn’t prepared with my camera for the first part. It burned really quickly and dramatically. 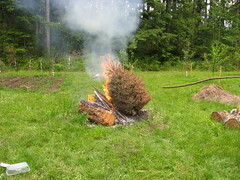 I think this may become something of a summer solstice tradition around here. 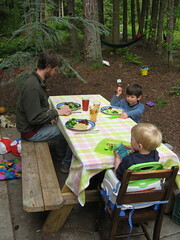 This is where we eat nearly all of our meals these days. I love that the weather is finally decent enough that we can suddenly realise we haven’t used the dining room table in 2 weeks. On the last day of March, we had sun, then snow, then sun, then snow….. It was cold and wet and what was that about March going out like a lamb? We got outside for a little while before dinner in one of the sunny spells, and there are definite signs of life in the garden, finally! 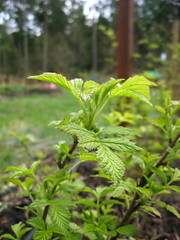 The raspberries are really getting leafy. 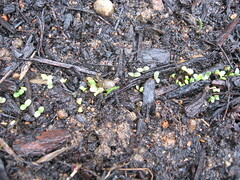 The salad greens are coming up already, despite the snow! You can just see the tiny green leaves there. 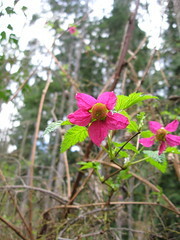 There are salmonberry flowers appearing all over the place! Thank goodness they have such bright flowers, because we’d never have known we have so many of them if they didn’t stand out so distinctly. Today, it was warm outside. Warm from the sun! No chill in the air, we spent the whole afternoon outside, playing, working, tidying up. It was delightful and I can’t wait for the weather to be more reliably like that. Somehow I had visions of lots of sparkly glittery pinecones. And yet, somehow, most of our pinecones turned into gnomes and santas. Or reindeer. We had lots of fun. Some of this morning’s photos. We honor Buy Nothing Day today, and we have our own tradition of turning it into Make Something Day. Specifically, Christmas ornaments. 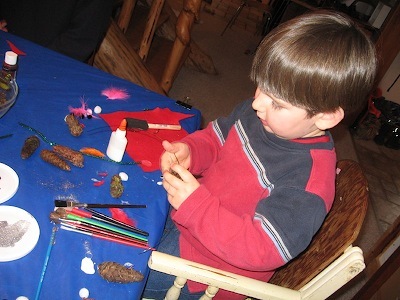 The craft will change with the years and skill levels of kids, but the idea remains the same: create some new homemade Christmas ornaments each year to add to our tree. And perhaps to give away. 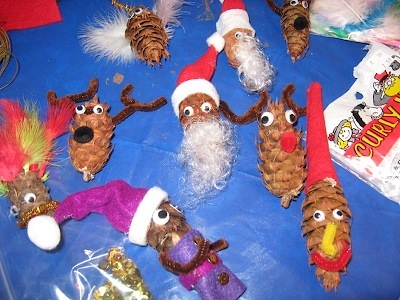 This year, our theme is decorating pine cones. 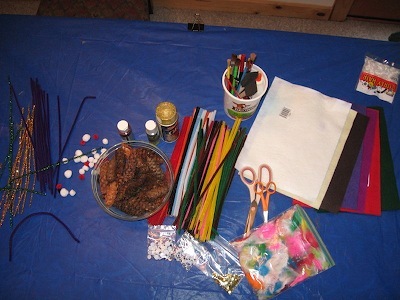 We have glitter glue, glitter spray paint, a glue gun, some felt and googly eyes and fake hair and pipe cleanersâ€¦. should be interesting to see what we end up with. We had a heavy frost this morning, heaviest Iâ€™ve seen in a long time, and we went out for a morning walk around our property to take pictures. Three of us had cameras, and there are distinct and interesting differences in the results.